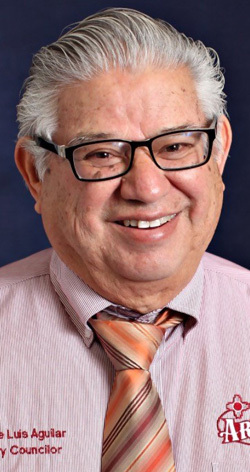 Services have been scheduled for longtime city councilor Jose Luis Aguilar of Artesia. Aguilar passed away Thursday, Aug. 18, 2016, at University Medical Center in Lubbock, Texas, at the age of 72. He served the community on the Artesia City Council from 1986-98 and 2010-16. A rosary will be recited at 9 a.m. Thursday, Aug. 25, at Our Lady of Grace Catholic Church, followed by a funeral mass at 9:30 a.m. at the church. Memorial contributions may be made to St. Jude’s Children’s Hospital or the American Heart Association. Funeral arrangements are under the direction of Ballard Funeral Home & Crematory of Roswell.